United Nations High Commissioner for Human Rights, Michelle Bachelet give updates for human rights situation for de world wen e address de 39 session. Michelle Bachelet, United Nations High Commissioner for Human Rights say situation for Cameroon di turn from bad to 'bades' dis pass moons as fighting di go before between goment and groups weh deh di carry gun for Anglophone regions. 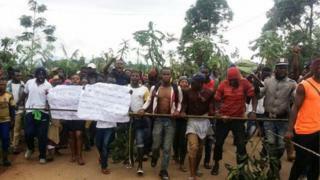 Wuruwuru bust for Anglophone regions for 2016 wen teachers and lawyers protest. Just now about 200,000 pipo run go hide for areas far from dia hause and deh need assistance for chop, place for sleep and oda needs. UNCHR say for dis kana unstable security situation many pipo di fear say deh go harm dem if deh take part for presidential elections. De rights agency say goment nova answer church pipo dia request for shiddon tok and no strategy nova dey for ground for just now for stop de fight. Deh also condemn kidnap teachers and students, and how pipo weh deh di carry gun di scatter schools dem for Northwest and Southwest regions. Dis kana bully di stop thousands of pikin dem for go school, UNCHR tok. Even as de rights agency note say goment don take some steps for make sure say pipo weh deh di violate human rights pay for dia crimes, deh say make goment give guarantee procedure for pipo weh deh ngata prison in connection with terrorism. "We di urge goment for address de complaints dem look for how for finish dis crisis inside peace", Michelle Bachelet tok.